With their iconic, modern design, our Contemporary chairs will be a charming addition to any outdoor space. Featuring a graceful curved rail, our teak garden chairs offer elegant style and comfortable, ample seating for you and your guests. Made from the finest grade-A teak, our Contemporary chairs can withstand any weather condition and can remain outdoors all year round for minimal fuss. Extremely durable without compromising on comfort, our teak garden chairs are sure to bring you long lasting fruitful use for years to come. With their simplistic design, these Contemporary chairs will work well as complimentary pieces to pre existing furniture. 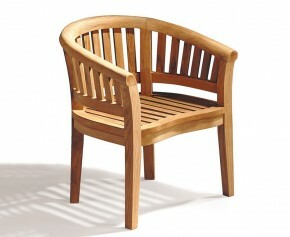 Choose from our range of Contemporary chairs.